Duke and North Carolina will open the NCAA tournament in Greenville, S.C., instead of Greensboro, N.C., because of the controversial "bathroom bill" that caused the NCAA to move the games from the Tar Heel State. Will the Big Dance return anytime soon? This year, as they have been so many times in recent decades, the North Carolina Tar Heels and the Duke Blue Devils are among the favorites to win the NCAA tournament. Often their path to a national championship has begun in their shared home state, which has hosted NCAA tournament games 30 times in the past 38 years. This year was supposed to be the 31st time, but the paths for UNC and Duke took an unexpected detour last fall. In September the NCAA yanked the first- and second-round tournament games away from Greensboro, N.C., and one month later moved them 190 miles away to Greenville, S.C., in light of North Carolina’s controversial anti-LGBT law. It takes the Tar Heels out of North Carolina, where their NCAA tournament record is 33-1 all-time, and places them in a state where they’ve never played a postseason game. Duke, which is 34-6 in NCAA games played in North Carolina, has played just two games in South Carolina, both in 2002, which was the last time the Palmetto State was able to host NCAA tournament games. South Carolina is itself just two years removed from the lifting of a politically related ban on hosting NCAA events. For 13 years, the state was ineligible to bid on hosting because the Confederate flag still flew above the Columbia statehouse. After nine black worshippers were killed in a Charleston church in a 2015 hate crime, the flag was removed, and the NCAA lifted the ban and allowed South Carolina back in the mix for tournament games. Less than a year later, North Carolina put into action House Bill 2, commonly known nationally as the “bathroom bill,” a law narrowly designed to force transgender people to use the bathroom corresponding to the gender on their birth certificate and not the one with which they identify. After multiple warnings, the NCAA removed this week’s games from Greensboro and awarded them to Greenville, and the future of the NCAA in one of its most frequently used states is now in doubt. Host cities for NCAA championships and tournament game sites from 2019 to '22 will be announced in mid-April. HB2 is still on the books in North Carolina, and the basketball-crazed state is running out of time if it wants a chance at keeping tournament games in the state through the end of the decade and beyond. Meanwhile, North Carolina’s loss has already become South Carolina’s gain after a 15-year drought, and there may be more to come. Play the Fox/SI Bracket Challenge! Kim Strable, the president of the Greensboro Sports Council, compared the city losing the NCAA tournament to a tornado warning. When most people first hear the warning they do the odds and continue about their day with some minor precautions. The warning continues, and this time they look out the window and see the clouds forming. And then . . .
North Carolina and the NCAA are strongly linked. This year marks just the third time since 2004 that no NCAA tournament games will be played in the state. Five times since 1979, two North Carolina cities have hosted games in the same year. Greensboro, which is about 45 minutes west of Duke and UNC, has hosted some memorable postseason games, including 23 ACC tournaments and the 1974 Final Four, when David Thompson and NC State dethroned UCLA, ending the Bruins' run of seven straight national championships. To be sure, North Carolina has lost far more than this weekend’s college basketball games. In April 2016, PayPal canceled a planned expansion into North Carolina that would have created 400 jobs, a move that the Charlotte Chamber of Commerce estimated had a $285 million loss to the county's economy. That same month Bruce Springsteen canceled a show scheduled for North Carolina. Pearl Jam did the same less than two weeks later. Last July, the NBA pulled the All-Star Game from Charlotte and eventually gave it to New Orleans. 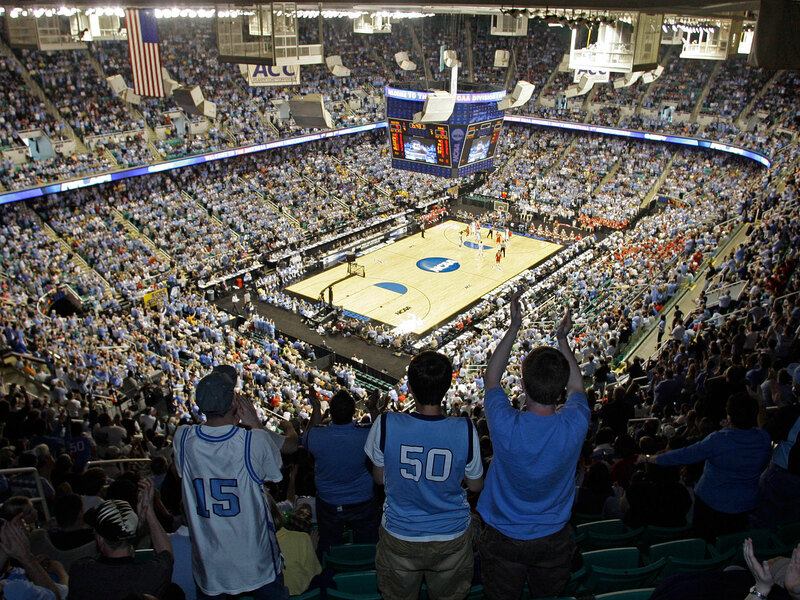 And after the NCAA took the tournament games from North Carolina in the fall, the ACC, which is headquartered in Greensboro, followed suit and moved the ACC football championship from Charlotte to Orlando (last week’s ACC men’s basketball tournament had long been planned for the Barclays Center and is scheduled to return to Charlotte in 2019). The law, instituted by North Carolina’s Republican-controlled legislature, is known as one of the most anti-LGBT laws on the books anywhere in the country. There have been flirtations with a compromise, but nearly a year later the law remains in place. In November’s election, Republicans maintained their supermajority in the legislature, while incumbent Republican senator Richard Burr beat his Democratic opponent, Deborah Ross, 51%-45% and Republican candidate Donald Trump won the state's presidential vote. One of the lone bright spots for Democrats last year was Roy Cooper, the attorney general who defeated one-term gubernatorial incumbent Pat McCrory—a supporter of HB2—by just more than 10,000 votes to become the governor. Duke coach Mike Krzyzewski called the law “embarrassing.” North Carolina coach Roy Williams went even further in early February, when a water crisis in Chapel Hill forced the Tar Heels’ Feb. 4 home game against Notre Dame from the Smith Center to the 23,500-seat Greensboro Coliseum the next day. The fight against inequality is more important than basketball games or rock concerts. But the other impacts are real, too. Greensboro’s visitors center estimated the city will lose nearly $14.5 million with this weekend’s games not taking place. Charlotte still has first- and second-round games in 2018, but those games are very much in limbo and could go the way of this year’s Greensboro games. Charlotte officials are planning as if the games will go on until otherwise noted. An NCAA spokesman said in a statement that the organization is “excited to have South Carolina host tournament games” this year, but declined to answer follow-up questions from SI.com regarding a deadline for North Carolina and the future bids. If a backboard breaks during warmups of one of this weekend’s games, Greenville has a plan for it. A rare March snowstorm in South Carolina? Thought of that, too. “Every meeting we have is, what haven’t we thought of,” Buddie said. The last time a South Carolina city hosted the men’s basketball tournament was in 2002, with first-seeded Duke and second-seeded Alabama leading eight teams to Greenville for the South regional. The year before, the NCAA had issued a ban on predetermined tournament games in South Carolina and Mississippi because the Confederate flag was still flying at their respective statehouses, but the NCAA allowed Greenville to keep those games because they were set before the ban was adopted. The NCAA lifted South Carolina’s ban in 2015 when the flag was lowered (Mississippi’s still stands), and cities like Charleston, Columbia, Hilton Head and Myrtle Beach, in addition to Greenville, could once again bid for NCAA championships and tournaments. Greenville had its eye on winning bids in the 2019 to '22 cycle that the NCAA was soon opening. When the NCAA took the games from Greensboro it opened an abbreviated bid period for other cities. Greenville made sense. The arena was available that weekend. The eight full-service hotels within five miles of the arena were willing to work with organizers to be ready that weekend. And, of course, Greenville was a logical choice geographically. In October, the NCAA awarded Greensboro’s games to Greenville, making it just the third time the state of South Carolina hosted the men’s basketball tournament (1970 was the first time). The group was excited, and then 20 minutes later, Buddie got an email from the NCAA with 13 attachments detailing instructions for hosting. It dawned on him that these were the same attachments Greensboro had gotten three years before. Greenville would have five months to get ready. And there’s even greater pressure on Greenville this weekend. Not only do they need to fill the 15,000-seat arena and run the event smoothly for the sake of this year, but also if they want to host another event in the next five years. 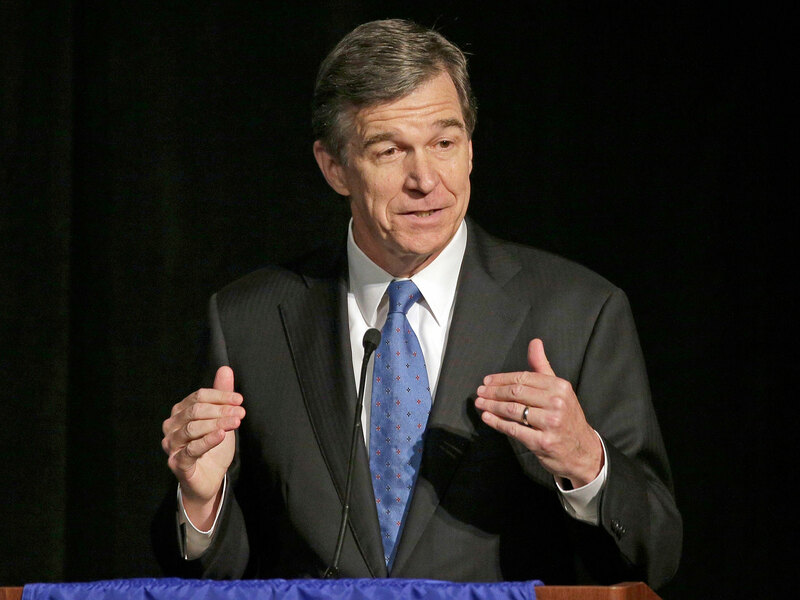 North Carolina's governor, Roy Cooper, is hoping to repeal HB2, the law that caused the NCAA and other organizations to pull events and businesses from the state. In the brochure sent to potential host sites as early as January 2016, the selection committees were slated to meet last fall and announce in December their decisions on more than 400 championship sites for four academic years starting in 2018-19. According to two North Carolina city sports commission presidents, that deadline is April 18. And they, along with Gov. Cooper, believe the NCAA pushed the deadline in order to give North Carolina, which has 133 bids for this cycle, time to repeal House Bill 2. If the law stays on the books, and Greenville performs well in its dress rehearsal, South Carolina could very well be hosting Tobacco Road schools for years to come. The NCAA hasn’t given North Carolina a hard deadline to repeal HB2, possibly because it doesn’t want to appear as a public ultimatum and especially because Texas is readying to debate a similar bill in its legislature. Texas’ Senate Bill 6 passed in a 7-1 committee vote and is heading for a full vote in the Republican-controlled Texas senate. What’s unclear is whether the NCAA would be satisfied with a compromise involving HB2, or if only a full repeal will do. Gov. Cooper and others are working under the assumption that the NCAA will have a drop-dead date in the coming days, since the announcement is scheduled for April 18 and the NCAA usually takes about a month between the decisions and when they become public. The 133 bids North Carolina stands to lose, which South Carolina would likely gain some of, involve men’s and women’s lacrosse, soccer and track and field championships. But the crown jewel is the men’s basketball tournament, which has 11 bids total in the cycle for Charlotte, Raleigh and Greensboro. The shot clock is about to expire on the state of North Carolina's tournament hopes, and it could be years before the ball is in their court again.